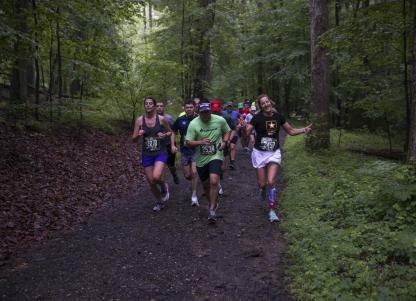 The Belleau Wood 8K commemorates the Battle of Belleau Wood by sending runners on a 4.97 mile run through the hills, trails and trees of Marine Corps Base Quantico. Run in the spirit of the Marines whose tenacity and ferocious spirit earned battle victories and spurred the French Army to recognize Belleau Wood, as the "Bois de la Brigade de Marine" or "The Wood of the Marine Brigade." All participants receive a technical short sleeve shirt and a special edition bib. New in 2019, all finishers receive a commemorative medal. Belleau Wood 8K participants will begin the 4.97 mile event 6:20 a.m. on the track in Butler Stadium. For three miles of hilly roadways, runners will climb Elliott Avenue and McCard Road. 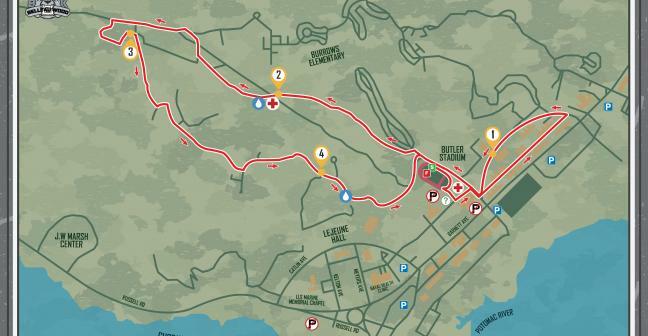 The final two miles will have runners tackling the aptly named Devil Dog Trail and racing through Stadium Trail. A few final turns on McCard Rd and Anderson Ave lead runners back into Butler Stadium where they will cross the finish line and claim a military-inspired finisher medal. There will be two medical aid stations on event day. One at Butler Stadium and one on course. Runners may participate in the Belleau Wood 8K hydration packs. All runner and spectator bags brought to the event site will be subject to search. Runners should use the clear plastic bag provided at Packet Pick-up to store personal items on event day. 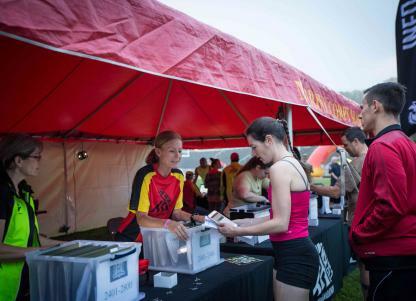 Check the bag at the Baggage Area near the MCM info tent on event day, located above the Belleau Wood 8K start line at the HITT Center, and retrieve baggage from the same location after a successful finish. The Belleau Wood 8K begins at 6:20 a.m. on the track in Butler Stadium. All participants will enjoy hospitality to include beverages and recovery snacks while visiting the Finish Festival booths and activities. Special gold challenge coins will be presented on event morning to the Belleau Wood 8K top three male and female finishers. First place silver coin awards in age groups will be distributed after finisher data has been verified. 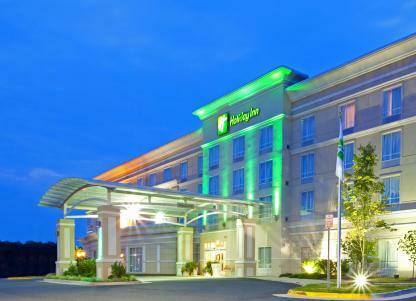 Parking is available in multiple locations near the start and finish line in the center of the Base. Signs direct participants to these lots from both exit 148 and 150 off I95. Runners may not park in the lot in the Crossroads Inn on Russell Road. Lejeune Parking Lot - Use 3242 Catlin Avenue. for map directions. Newlin Hall - Use 3255 Meyers Avenue for map directions. Naval Health Clinic Quantico - Use 3255 Meyers Avenue for map directions. Friends and family members are welcome and encouraged to cheer their runner. Spectators have four opportunities to see their Belleau Wood 8K runners, all conveniently located near Butler Stadium. After viewing the runner cross the start line, spectators should exit the rear of the stadium near the bleachers. At John Quick Avenue, spectators will see their runners near Mile 1 and again as runners exit Stadium Trail onto John Quick Avenue. Spectators should then return to Butler Stadium as runners approach the finish line.